Happy birthday, Laura! What a privilege to celebrate my youngest daughter turning another year older. A privilege I would’ve chosen to miss at one time. I wrote about Laura being our surprise baby here, and many of the lessons God taught me through her tiny, pre-born life. I’m so glad God is in control and not me or Laura wouldn’t be here. What a life-altering loss that would be for us and so many others, including her new husband Josh, who is still smitten! Hang it on your front door for the birthday boy or girl’s entire birthday week so everyone in your neighborhood knows it’s someone’s birthday. Hang it on the birthday person’s bedroom door. Hang it in your kitchen for the week so you remember to celebrate the amazing gift God has wrapped up in your child or spouse. Another idea is to get one for your office or school classroom. The HR team at FamilyLife hung the banner outside the office of FamilyLife staff members on his or her birthday. The bright colors make sure everyone notices! God knit each one of us together in our mother’s womb. Each of us is fearfully and wonderfully made. He has assigned us a specific number of days to live. And that number is exactly the right amount, even written in one of His books. He knows when we stand up and sit down. If we run away and hide. He still knows where to find us. Amazingly, before we speak a single word, an entire speech or blurt out a cry of joy or pain, God knows beforehand what our mouths will utter. David said, such knowledge is too wonderful for me! As you celebrate birthdays this year, give thanks for all the intricacies of the birthday boy or girl, but also help your family give thanks for our Father in Heaven who knows us better than anyone and loves us no matter what. Congratulations to Kate for winning this giveaway! 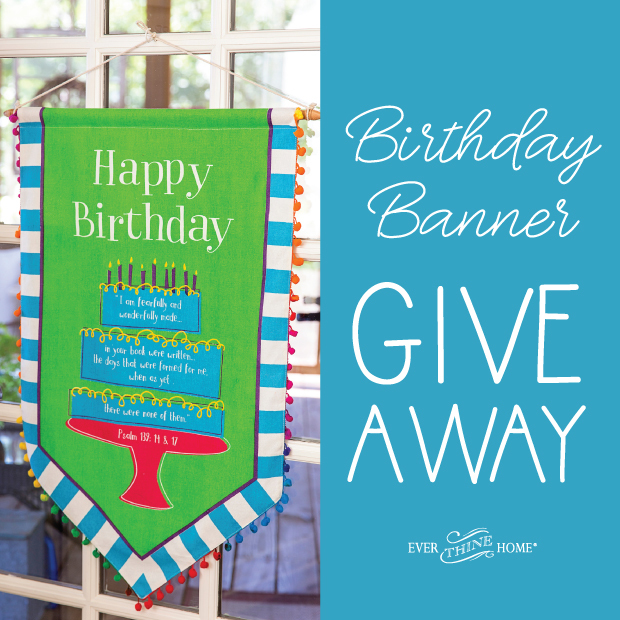 We are excited to give away one of our Brand New “Happy Birthday Banners” to one of you! Details to enter are below. My favorite birthday memory was a collections of birthdays. My birthday was in the summer. My mom organized many birthday parties in our 1/4 acre backyard. We had ice-cream cake. We played old-fashioned birthday party games like hot potato and pin the tail on the donkey. It was simple and fun. Everyone had a great time. Thank you for allowing me to post this as I stroll down memory lane. My favorite birthday memory is my 30th one. My husband threw me a surprise birthday party at our church. My mom was in on it and did my hair and nails as she did on a regular basis. She then asked me to go to the church with her since she forgot something. Instead she lead me to the fellowships hall where my wonderful husband, family, and many friends were gathered and totally surprised me with a special day! It is even more meaningful now as it was the last birthday I would have with my mom. Sadly she died six months later with ovarian cancer. I am thankful to have this birthday memory with her. My favorite birthday memory was when I turned 40 my husband surprised me with a trip to Myrtle Beach with my best friend. We both turned 40 that year within a week of each other. My surprise was a week late because she was receiving hers that day too. We spent a glorious week together!! Rumor has it we may get it again this year when we turn 60!!! Birthday’s have never been the same with this friend in my life!!! Celebrating Darlene!!!! 🎂 My favorite birthday was knowing I would celebrate with my Dad. I was born on his birthday so we always had a sheet cake halved decorated for me and the other half for him. One year mine had a Cinderella carriage with a prince and Cinderella on my side and his had a tie and dress shoes. Oh how I loved those toppings. Many years later he would ask God forboneblast birthday with me and a week later to the date we said goodbye to my Dad as he went to his forever Home. Weeks later I found out I was expecting our first child. It was a great birthday and now when my oldest hears this story being the reason why we chose his name it makes sense to him. We named him Isaac (laughter) cause that’s what he brought into our lives after loosing my birthday partner. So I guess I have two favortite biethdays. Over my 48 years, I have had lots of fun birthday memories but one in particular stands out. My husband and my toddler sons sent me on a scavenger hunt across town. At each of the stops, I got a surprise like a facial or pedicure. Then when the day was over, my husband and boys had prepared a birthday meal at home. It was truly a sweet gift to a young frazzled mom of two active little boys! My birthday is Christmas (12/25) so I tend to forget it’s my own birthday but my family doesn’t. I feel blessed to have spent every single birthday, all 54 of them, with my family who remind me how important relationships are and most especially the one with Jesus. We had a 4 year old son and a baby girl and surprise! I was pregnant; there would be 14 months between babies. Not happy and terrified. I eventually said Thy will be done! Hallelujah baby Heather was born on our 6th wedding anniversary and she has multiple college degrees and has chosen now to be a nanny/governess for wealthy families too busy to rear their children. God is faithful and good all the time!! Every birthday has been a blessing and I’m thankful for every morning I open my eyes and rise. I always loved decorating for my girls’ birthdays with streamers, balloons and a birthday clown window decoration. Now I have the blessing of celebrating birthdays with 6 precious grandchildren, still sometimes hosting and decorating. I would love to honor them with you beautiful new banner! While 40 could have been a hard birthday number to turn, it really was a blessing. I was 6-7 months pregnant with our first son and was amazed this was happening to me. I always hoped to be married, but didn’t meet the right guy till mid to late 30s. Ben was born in 2009, and then a month after my 43rd birthday, Joseph came into the world! Thank you Lord. My favorite birthday memory is my husband getting down on one knee to ask me to marry him! The birthday banner ideas are great, as all your ideas are, Barbara! Happy Birthday to Laura! Every year, on the night before our children’s birthdays (after they’re in bed), my husband and I hang balloons, streamers, and a special birthday banner in the same spot in our dining room, so when they wake up on their birthday, they’ll see how much we love to celebrate them! We set out all their presents and everything! I was starting to think this year that maybe my 12 year old was getting “too old” for it all, but she asked me the night before her birthday, “Are you guys going to set everything out for me for tomorrow?” 😁 They love it!! My 40th birthday was so much fun! Hubby planned a getaway to OKC with several friends and we all had a ball! My birthday is in the fall and it’s always fun to have a birthday tailgate during a football weekend with family and friends. This year my daughter was home from college for her birthday and she had saved all of her birthday coupons she received from various stores and restaurants. She wanted to go shopping and use her coupons that day. When I added my coupons, we had 2 restaurants and 8+ stores to visit. She felt special all day long and I had fun with her. That night we had dinner with siblings who were in town on her favorite china that was her grandmother’s. I think we might have a new tradition! One year when I was about 11 or 12 my sweet mother had a severe migraine on my birthday. My dad allowed me to stay out of school and take care of her that day. I baked my own birthday cake and took care of my mom, seeing to her needs as she had always taken care of mine. It was a sweet time. It might seem like a sad memory but it is a happy one! Having 8 children, I have many wonderful birthday memories. One of the most remarkable is when my youngest daughter turned 7. As we celebrated, we noticed there was a rainbow, and we’re delighted to see it was a TRIPLE rainbow! She felt so special and loved by God! A special memory was the other year I was invited to a Princess House party but couldn’t go.. my husband surprised me with the kettle that was on sale in the flyer!! My happiest birthday memory is when my husband surprised me during our courtship. I had Ulcerative Colitis at the time, and he made a special meal for me. Also, he wrote a poem for me; although he is no poet, the poem was heartfelt and thoughtful. To finish, he gave me a romantic cd of old-fashioned love songs, then danced with me in the kitchen. Well, I married him, and today he is sweeter than he was then. Kate — what a sweet memory of your husband! So thankful for his kindness to you then AND now! We are excited to let you know that your name was randomly selected as the winner of the Birthday Banner! :) We will e-mail you for your address. Thanks for participating and sharing! My oldest daughter’s 11th birthday was a favorite. We spent the weekend in Atlanta doing Passport to Purity and going to the American Girl Doll store. She’s leaving for college this year and those memories are priceless! Love this banner!! My favorite memory is sharing my birthday parties with my aunt whose birthday was two days after mine. My most memorable/favorite birthday was a surprise 16th shared with my friend, Katie in our newly remodeled basement. Our birthdays are 2 days apart and our dear parents and friends blessed us with a fun celebration of the Lord’s goodness toward us! One of my favorite birthday memories is my 21st birthday. I was in a Carnival Cruise Ship(Imagination), and my teacher and classmates surprised me during our dinner. All the waiters came out with a tray on top of their heads and a piece of cake on each tray. They walked around the dining room singing “Happy Birthday” to me. This was the first time that my parents let me travel without them and my friends made my day special. Mine and my husband’s birthdays are one day apart. For 27 year’s of marriage, I have enjoyed celebrating with him. My favorite birthday was my 40th. My little 10 year old daughter wanted to do a love-gift for her mommy-a surprise birthday party! She got her daddy’s permission, planned it herself; the buffet style food (her Auntie helped her cook), the beautiful decorations, invited all my friends…and surprised me with a lovely birthday dinner for about 20 people, outside on our patio! My gift from her was…a beautiful scrapbook, each page lovingly decorated by her with words expressing appreciation for all I’d done for her. What a love-gift! She’s 23 now, and we’re still close. My favorite birthday was when I was dating my husband! We had a long distant relationship and I was helping my family with chores outside! My dad went in the house to take a break and came back shortly to tell me I got something in the house. My dad said and there is 12 of them! So cute my dad counted the roses! It was the last year I got to celebrate a birthday with my dad! But I’m thankful for his legacy he left me and my siblings! Also so thankful He also got to meet the man I married even though he didn’t get to walk me down the isle. Thanks for letting me share my favorite birthday! As a music teacher, I used to take my third graders to the CSO, Chicago symphony orchestra. One year our trip got canceled because of a January blizzard. The rescheduled day ended up on my birthday in April. We sat close to th front of the huge, historic auditorium. When the conductor asked if anyone had a birthday, I was the ONLY one who had a birthday – out of the thousands in attendance. Guess what? The entire place sang happy birthday to ME, accompanied by the amazing CSO. I was a bit embarrassed but it was amazing and is a birthday I will never forget! My husband and brother in law planned a surprise 30th birthday party for my me and my twin sister. It made me feel so loved and special for the effort to be made. Two high school friends planned a big surprise 16th birthday party for me at one of their houses and I almost didn’t go! They invited me to hang out and I wasn’t feeling super great so I was going to cancel. My mom encouraged me to go while sweating since she knew what they had planned. I agreed to go and it was a great, heart-warming time! Birthday memories are more special when you are older and think back fondly of your parents who have gone on to Heaven and how they celebrated your birth when doctors told them they would never have a child, God turned that news around 18 yrs later. Never gets old no matter how old I get with wonderful memories of sweet birthdays of joy. Another fabulous way to celebrate birthdays! My mom would make a special meal – whatever we requested – and then the birthday person ate their meal on a special plate that said “you are loved”. Definitely made me feel special every year! My favorite birthday memory was from my 30th Birthday! I thought I was planning my Mom’s 50th suprise party, but when I got to the party surprises was on me. All of my friend and family were there. All along my amazing husband and my mother planned it all. My favorite memory is celebrating with all my family and friends at my favorite restaurant! Shared. Love celebrating my kiddos birthdays every winter and their Gotcha Days every summer. So blessed to celebrate these 2 amazing lives! My favorite birthday ever was a trip to Disneyland when I turned 36. I had my family with me including my dad, his wife, my brother and his family. A big group. Dad took me to “check in” at the beginning of the day and brought me a pin to wear saying it’s my birthday. So amazing! Every cast member that I saw and some Park visitors all wished me a happy birthday. Dad and Christie treated us to Club 33 for lunch, that was stellar! When I arrived back at our beach rental(we live in Idaho) I opened my pc (no smartphone yet) to Facebook and was shocked at all of the birthday wishes I saw there (when this sort of thing on FB was new) I am now 44, so this was a bit ago. What a day!! Every year my mom would make our birthdays special. We always had a cake and a special meal. Our presents were put on the piano bench. My birthday is in the month of May so Mom would always let me open one gift before I went to school. Now as a mom I try to make our boys’ burthsays Special br decorating their doors, special food, and sweet moments together with family and friends. I especially love being able to allow our other family members to bless the birthday person with life-giving words of affirmation and blessing. No matter the age, encouragement is always good. The first birthday we celebrated with each of our adopted children. They are 3 siblings and it was such a joy to be able to celebrate them, the gift they are and being a mom after years of infertility! Sweet16 with 16 pink roses from my dad! He never got me flowers. For everyone’s birthday my mom would set out what our family called “The Red Plate”. It was an old china plate with a red toile pattern. The birthday girl or boy would get to use The Red Plate for all their meals on their birthday. My brothers & I were always so excited to use this piece of china because it made us feel important & special. We would always remember to set the table with The Red Plate for Dad & Mom’s birthdays too! I even remember Mom setting it out if we had a guest who was staying with us & it happened to be their birthday. I would really like to find another “Red Plate” to use in my home for my children & husband. I shared the birthday banner post on Instagram! I love my kid’s birthdays! The “Birthday Fairy” decorates their rooms while they are sleeping the night before their birthdays. It always involves lots of balloons and streamers! We spend the entire day together because all of my kids have summer birthdays! I can remember my mom always making whatever special meal we wanted! And beautiful homemade birthday cakes! i have 6 children and each one of them expects Indian Tacos, which is a delicious delicacy for us. my oldest is 30 and youngest is 14. our special memory is when their grandma would always attend just to be with them. I make the birthday boy or girl’s favorite meal and we invite grandparents over for the meal to celebrate. Whoever is celebrating their birthday gets to choose the kind of birthday cake and decorate it. Although 2 of my 3 kids are out of school, we still celebrate this way when they can come home from college. Every year my mom would let us decide (for as long as I can remember) what we wanted to eat for our special birthday dinner. She would lovingly prepare our selected meal, and I plan on continuing this birthday tradition with our two children. It might sound simple, but even as a small child I knew it was more meaningful and special than driving to a restaurant and paying someone else to cook food. Thank you, mom! We always celebrate each family members birthday with a special dinner that includes using the “fancy” dishes from the china cabinet. My kids think it is the best!!! Every year we pull out a special birthday plate and mug. We let them choose what they want to eat for each meal and the activities for the day. Then at night, I write down in a special book all of the accomplishments my kids have achieved, life changes, and how proud I am of them. For their 18th Birthday, I will make them a book of everything I have written down. My husband surprised me with a getaway for one of my birthdays. He packed my bags and everything! Then when we got home all of our family was at our place for a pizza party. I was amazed and felt so loved by all of the planning he did for my special day. Celebrating my birthday with my Grandpa each year – our birthdays we’re just 3 days apart. Now he is with the Lord but I still think of him each birthday. ☺ Precious memories!! My husband planned an entire day of various activities and gifts given to me from different people throughout my day for my 20th birthday. Then he proposed to me that night and we celebrated afterward. Memories of that day are definitely some of my very favorite birthday memories. We just had the privilege of celebrating my first Grandson’s 1 year birthday! Being a Nana is the best gift yet! The banner is beautiful and unique just like our Grandson. It would be a welcome asset to celebrate yearly as part of a new tradition. Thank you for sharing with us Barbara! Celebrated my 6th decade last Jan! My favorite birthday memory doesn’t really involve my birthday, per se, but when I gave birthday to my son, our firstborn, on my husband’s 26th birthday. He was also born the day after my dad’s 45th birthday. The other fun thing about this memory is the fact that my son was born on January 2nd, but that year New Year’s day was on Sunday, so all the parades and football games were happening to celebrate his arrival! (Just kidding!) What fun it would have been to have a banner like this at the hospital and ever year after to celebrate these three amazing men in my life!! One of my favorite birthday memories was the year I turned 24. My first nephew was born on my birthday that year. He was the best present ever. Love the bday banner you created!! Each year on each of our kiddos’ bdays we walk down memory lane by reminiscing over their baby albums and DVDs. Such a treasure to do this as it takes me back to the time when they were just little babes. My favorite birthday memory is my 16th birthday. So fun to be able to drive and the love that was shown from friends, family, and many others revealed to me just how blessed I am. 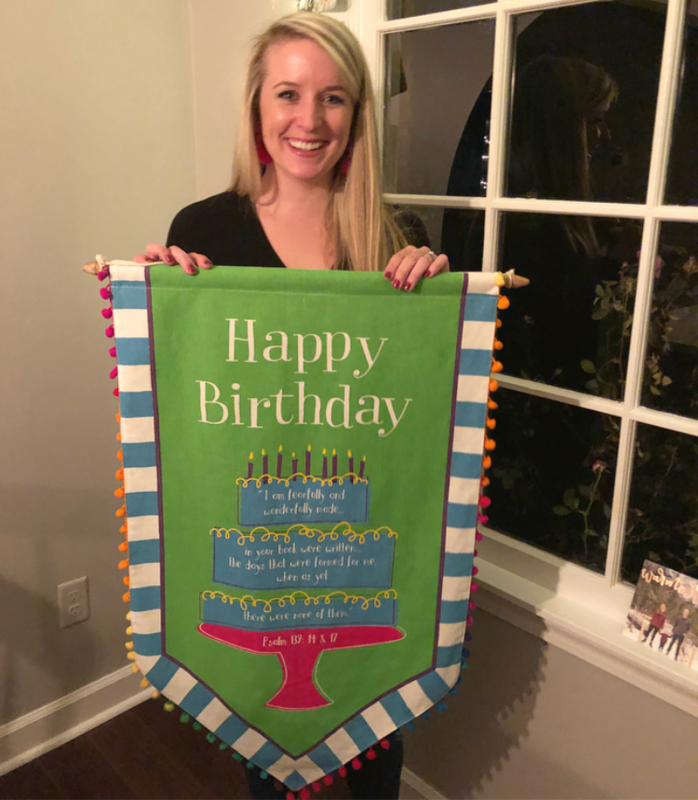 My most favorite birthday celebrations are for my 5 little grandchildren, & they would be thrilled with this birthday banner! Can you also purchase it? My earliest memory is my 3rd birthday- I cried every time they started singing “happy birthday”. By the third time my mom figured out that they were “starting without me”. I still vividly remember my Strawberry Shortcake birthday cake and the indignant feeling of everyone singing before I could get started! My mom always made me feel special on my birthday by always being able to pick the birthday meal and cake. Having the whole family together to celebrate. My favorite birthday was this past November 2017. My birthday was the day before Thanksgiving and all the children & grandchildren were home. (From California, Colorado & Arkansas) I came downstairs that morning & there were crepe paper swags everywhere, balloons, handmade banners, party hats & a delicious breakfast all made by my children & husband. Fun & laughter all around! It was the best birthday ever!! A favorite birthday memory is our oldest daughter waking up on her 4th birthday to a tea party for dolls set around her little toddler table. She was so very excited! Hope all 3 of our girls always feel special and loved by us and their creator! My favorite birthday memory was when I turned 7 on the 7th of the month. My mom said it was my “golden birthday” and I was given a gold dolphin pendant that I wore proudly to school. My favorite birthday was my 23rd. I was in labor with my first child. She was born the next day. I was married on my 21st Birthday and my husband (of 27+ years now) was the very best birthday present ever! So Blessed to be his wife and minister by his side! My best memory at all, when I was turning to my two diggit number, we take a family vacation to know the ocean also, bi Birthay surprise was the hotel restaurant prepare a cake an a meal just for my family, in a big table at the hotel restaurant, the servers are just a cortesy of the hotel management..what a remarkable Birthay for me. Love this! Favorite Birthday memory was my 30th, my husband unbeknownst to me planned a surprise party with our close family and friends. He did everything, decorated had a Hawian theme, catered and my favorite cake. This is really not his thing and I was so surprised it was absolutely a labor of love for him to do ❤️ And I was so thankful. Every birthday is special but I think my 13th was my favorite so far. All of the girls/ladies in my family came together for a birthday tea party. It is one of the last memories I have of my Nannie before she died shortly after. Every year we take our kids out indivially for their birthdays! So love this one on one time with each kid. They get to pick their place to eat then we let them pick something out for their birthday. I love love this banner! When my husband and I had a double 30th birthday party and instead of presents, took a weekend trip to celebrate our birthdays! Fav memory was 60th and 60 roses. My favorite birthday memory was the year (1995) we brought our baby girl home from the hospital on my birthday! 22 years later we still celebrate the day-in- between-our- birthdays by getting mani/pedis together. Every year when each of my children celebrate their birthday I pull out their baby book that has so many memories and pictures of them when they were little. We always give the kids a scrapbook of the year on their birthdays. We decorate the house with the theme of their choice and spend time sharing memories- flipping through the scrapbooks. Absolutely fell in love with this banner the first moment I laid eyes on it! How sweet would it be to hang it in the hospital room for baby #2? Don’t know why I’m thinking about babies. Maybe the Lord is sending one our way soon. Anyways, my most favorite birthday memory would be my 21st. 3 months into marriage, we found ourselves absolutely smitten with a tiny little angel in my belly. That morning was such a blessing. I’ll never forget the day I saw 2-4 weeks show up on the pregnancy test screen. Happy birthday to me! Oops. 22nd birthday. That’s a mama brain for ya! Ha. What a WONDERFUL idea, Marcie!! :) I love your birthday memory! So sweet! Every year we hang my paper streamers on the birthday child’s bedroom door. My favorite memories are watching the joy on their faces as they come out each birthday morning! !